The dark rover ant (Brachymyrmex patagonicus) is an invasive species which is increasingly being noticed in Southern California. It is a nuisance species that invades structures as both workers and winged (alate) individuals. This article aims to introduce structural and landscape pest management professionals (PMPs) to the dark rover ant and includes several important references for readers to learn what is currently known about its biology, behavior, and control. Dark rover ant (DRA) workers are usually 1–2 mm long and are typically reddish-brown to blackish-brown (Figure 1). They have one node on the waist hidden under the gaster (abdomen), with long erect hairs mixed with sparse fine pubescence on the gaster (Figure 2), and nine-segmented antennae (Figure 3). The only other rover ant species reported from California is B. depilis which is rarely seen in the field (1) and can be distinguished from DRA by their yellow to yellowish-brown color (2). Where are dark rover ants found? The dark rover ant is native to South America and is found in several countries including Argentina, Paraguay, Brazil, and Venezuela(3).It was first discovered in the United States in 1978 in Louisiana (4). This ant was found in California for the first time in 2010 in Orange and Riverside Counties (5). The author found this species in Los Angeles County in Pacoima and Sylmar as well as Citrus Community Park (Riverside, CA) and Andulka Park (Corona, CA). Pat Copps of Rollins Inc., reported DRA presence in Bakersfield. This species may already be widely distributed in Southern California and could be dispersing to newer areas. DRA nests both indoors and outdoors (6). They forage without making trails but trailing has been observed in the laboratory between the sub-units of a colony (7). High levels of aggression toward individuals of other colonies has been observed, which may prevent the establishment of multiple colonies in a small area (8). 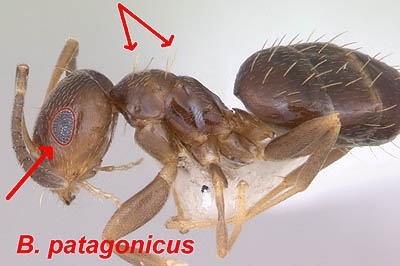 Different authors have reported that this species can coexist with other ant species, most notably Argentine ant (Linepithema humile) and red imported fire ant (Solenopsis invicta), and has even nested alongside the latter (4, 5). In Los Angeles and Riverside counties, the author has seen DRA workers walking near trails of red imported fire ants and Argentine ants without alarming the workers of these other two species. DRA have been observed feeding on plant nectar in the field. In the lab, a 30% honey solution along with a liquid tuna mixture and caterpillars has been observed to support reproducing colonies (7). Foragers and alates of DRA invade structures and can become nuisances. In Orange County, there were more incidences of DRA infestations in 2018 as compared to 2017. In June and July of 2018, customer calls were made regarding reproductives when clients saw them at bright lights inside. David Taylor from The Bugman Pest and Termite Control reported that clients were often unaware that workers were also present. 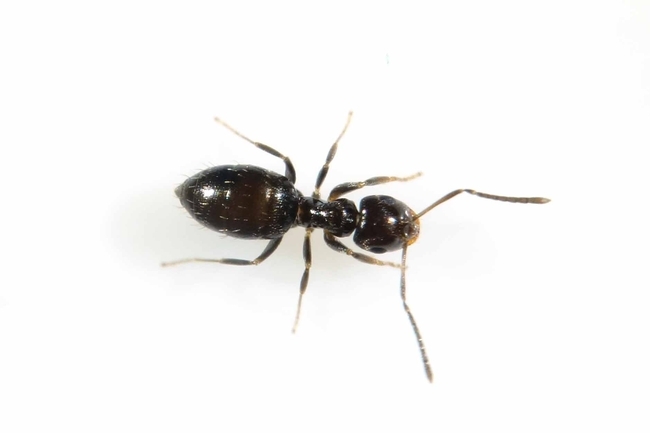 According to Pat Copps, in southern California, DRA infestations have been more common in Orange County but are still relatively rare as compared to the pervasive Argentine ant, which accounts for about 90% of customer calls for ant infestations. He also says DRA foragers are usually seen in kitchens, bathrooms, and laundry rooms inside and around grade/wall junctures, stone borders, patios, and tree roots. Pest management professionals have reported difficulty in managing dark rover ants in other parts of the United States (4). This is believed to be due to the existence of long-lived satellite colonies, which can survive for around three months when separated from the main colony (8). Consequently, a structure treated for DRA may soon be re-invaded by ant individuals from adjacent satellite colonies. In California, similar difficulties have been reported in controlling this pest. These difficulties have been overcome by some PMPs by using combinations of baits, dusts, and liquid sprays as interior and exterior treatments. Copps reported that very limited success has been achieved when attempting to control this pest outdoors. 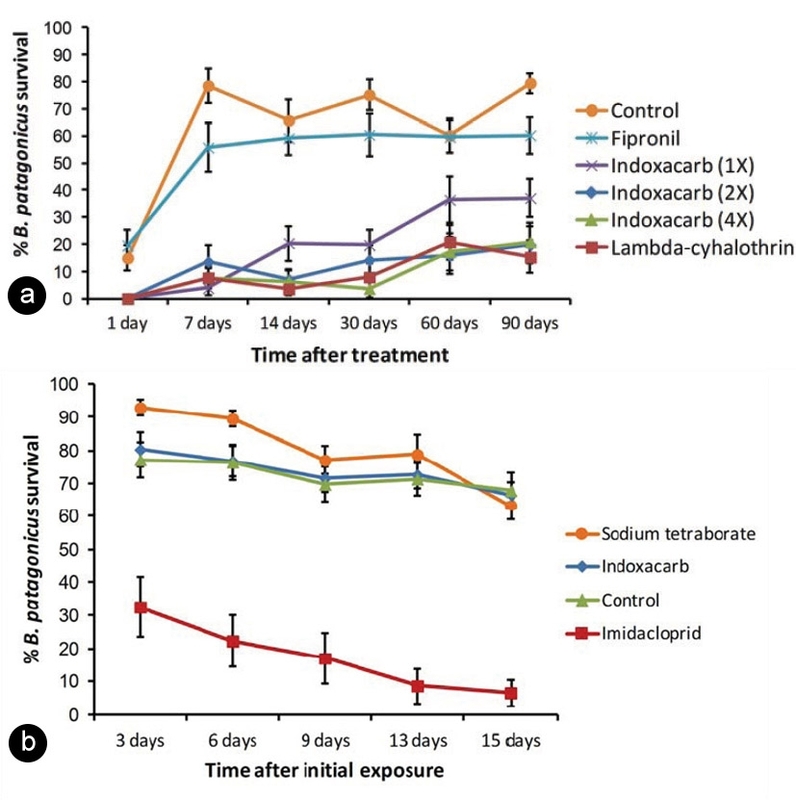 Research by Miguelena and Baker (6) on the efficacy of selected pesticides against DRA showed higher ant mortality when using Arilon (indoxacarb, Syngenta) and Demand CS (lambda-cyhalothrin, Syngenta) liquids as well as Maxforce Quantum ant bait (imidacloprid, Bayer CropScience) when compared to other insecticides used in the study (Figure 4). Since DRA control failure is very common, it is important for PMPs to consider using products which have been scientifically proven to be effective in controlling DRA. Other products may eventually prove to be effective against DRA, but at this time there has been limited published research on the management of this pest. Figure 4. Survival (%) of dark rover ants after exposure to several liquid insecticides (a) and bait (b) applications in a laboratory study (6). 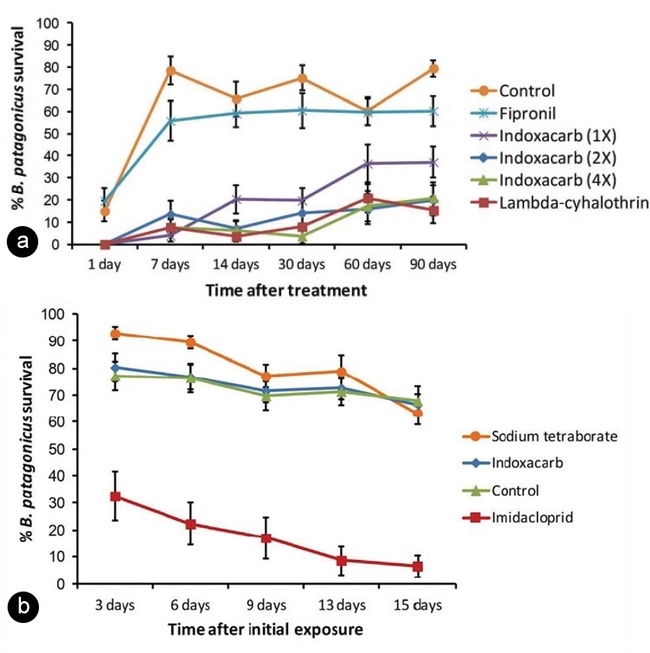 Products used in this study: a) Termidor SC (fipronil, BASF), Demand CS (lambda-cyhalothrin, Syngenta), Arilon (indoxacarb, Syngenta) b) Maxforce Quantum ant bait (imidacloprid), Intice rover ant bait (sodium tetraborate, Rockwell labs Ltd.), Advion ant gel (indoxacarb, Syngenta) (Miguelena and Baker, 2014). 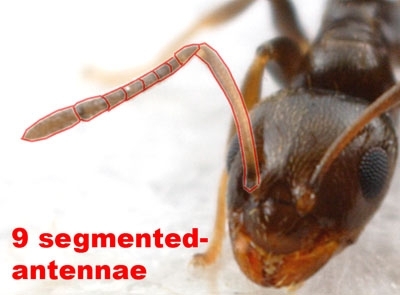 Ward, P.S., A synoptic review of the ants of California (Hymenoptera: Formicidae). Zootaxa, 2005. 936(1): p. 1-68. McGown, J.A. Ants of the Southeastern United States. 2003. Quirán, E.M., J.J. Martínez, and A.O. Bachmann, The neotropical genus Brachymyrmex Mayr, 1868 (Hymenoptera: Formicidae) in Argentina: Redescription of the type species, B. patagonicus Mayr, 1868; B. bruchi Foel, 1912 and B. oculatus Santschi, 1919. Acta zoológica mexicana, 2004. 20(1): p. 273-285. MacGown, J.A., J.G. Hill, and M.A. Deyrup, Brachymyrmex patagonicus (Hymenoptera: Formicidae), an emerging pest species in the southeastern United States. Florida Entomologist, 2007. 90(3): p. 457-464. Martinez, M.J., et al., New records for the exotic ants Brachymyrmex patagonicus Mayr and Pheidole moerens Wheeler (Hymenoptera: Formicidae) in California. The Pan-Pacific Entomologist, 2011. 87(1): p. 47-50. Miguelena, J.G. and P.B. Baker, Evaluation of liquid and bait insecticides against the dark rover ant (Brachymyrmex patagonicus). Insects, 2014. 5(4): p. 832-848. Tamayo, D. Dark Rover Ant: Brachymyrmex patagonicus Mayr. 2011. Miguelena, J. and P. Baker, Why are rover ants (Brachymyrmex patagonicus) so difficult to control? Graduate Student Poster Session, Entomological Society of America Annual Meeting, San Diego, California, 2010.